Out parcel shopping center adjacent to Walmart Supercenter with shared US-1 access. Heavily traveled corridor. Anchored by Aldi, Mattress Firm, Aspen Dental and T-Mobile. Over 715 feet of frontage on US-1, strategically located on the SE corner of US-1 and SE Miami Ave.
however, it is provided without representation or warranty. 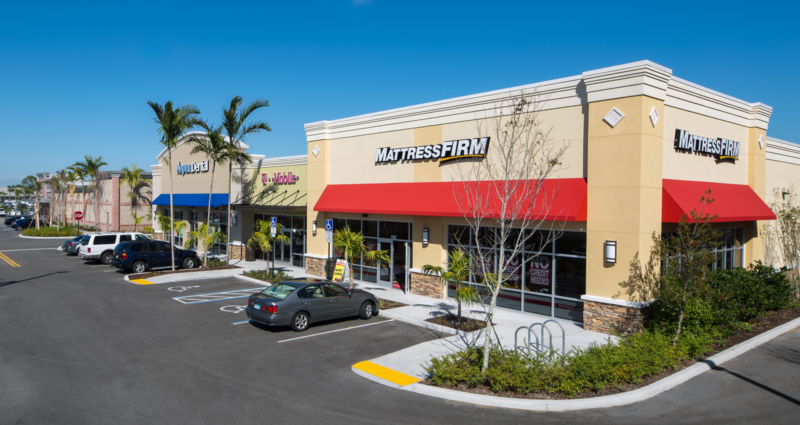 The Marketplace at Coconut Point is located in Estero, FL and is the last remaining commercial frontage within the Coconut Point Development, which includes over 140 stores and up to 1.5 million square feet of retail. Located along the east side of S. Tamiami Trail/US 41 (traffic counts of 48,500), the property has excellent visibility and accessibility. It has proximity to Hertz World Headquarters as well. Plans for the site include a national grocer and availability for restaurants, coffee shops, QSRs, high profile inline and freestanding retail or banks. 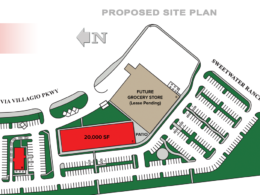 Up to 75,000 square feet of retail space now available! Vero Beach Square is a community shopping center currently under development in the area’s major retail corridor along State Road 60. This location offers cross access with Walmart Supercenter, Sam’s Club and 58th Avenue and shares a traffic light at 53rd Avenue. 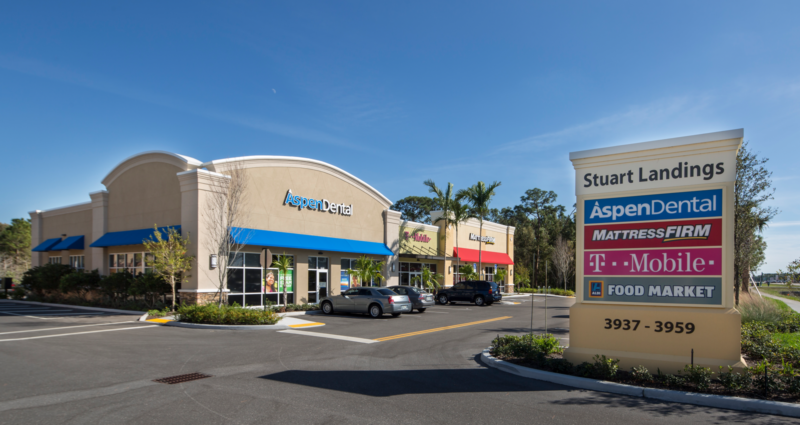 Located in the area’s major retail hub which includes Indian River Mall and multiple power centers. Join these national tenants: Staybridge Suites, Murphy USA, 1000 Degrees Neapolitan Pizza, Tire Kingdom, SuperCuts, Tropical Smoothie Café and Dunkin’ Donuts. 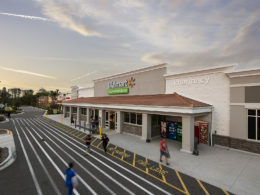 Landstar Marketplace is a Walmart Neighborhood Market anchored shopping center located on the SEC of Central Florida GreeneWay (SR 417) and Landstar Blvd. The property is approximately 1.3 miles east of the Florida Turnpike interchange and 1.5 miles north of Osceola Parkway. 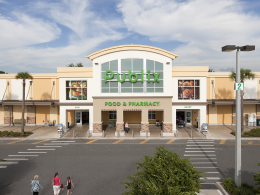 It is surrounded by new and planned residential developments, and sits cater-corner to a Publix anchored shopping center. 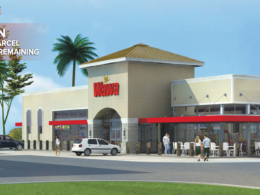 West Commercial Landings is a new retail development project by Konover South Development Corp. featuring Wawa, Learning Experience, Burger King and shop space. Located between the Sawgrass Expressway and University Dr. at the SW corner of Commercial Blvd. and NW 94th Ave. with 45,000 cars per day at the intersection. Great access and visibility with over 750 feet of frontage and two existing curb cuts on Commercial Blvd. 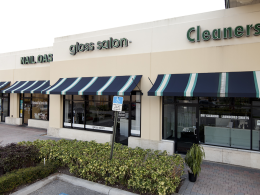 Located next to a high-volume Publix-anchored shopping center. Join Panera Bread and CVS at Yamato Crossing on Yamato Road in Boca Raton, FL. The center’s tenants enjoy a population density of 64,815 people with an average household income of $109,440 within 3 miles of the site, in addition to an average daily traffic count of more than 69,000 cars per day. This 200,000 square foot center is located in Stuart, Florida on the southeast corner of Federal Highway and Monterrey Rd, with 73,000 cars passing the site daily as of 2017. 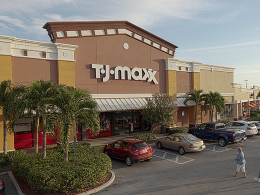 The center enjoys very strong co-tenancy with Five Below, TJ Maxx, HomeGoods, PetCo, Office Depot and Bonefish Grill anchoring the center. Additionally, within 5 miles there is a population of more than 103,000, people with an average household income of $84,352 and over 59,000 employees working within this very strong trade area. Join Publix, Peachwave Yogurt, Dunkin’ Donuts, Zaxby’s, Hair Cuttery and many others at Park View Commons on Maricamp Road in Ocala. This center has the best combination of high population density and income that presently exists at any other grocery location within Ocala. The center’s tenants will enjoy a population density of 47,120 people with an average household income of $67,357 within 3 miles of the site in addition to an average daily traffic count of more than 45,000 cars per day. 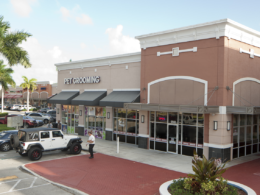 This 110,000 square foot shopping center and office building is located at the corner of SW 120th Street and SW 127th Avenue in Kendall in a high traffic area. 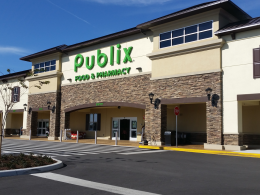 It is located less than one mile west of a Florida Turnpike exit and directly across from a 61,000 SF Publix shopping center. Current tenants include Bonefish Grill, Walgreens, ABC Fine Wine & Spirits, Wing Stop, Starbucks, Robeks, Bank of America, Chase and KFC. This prime location enjoys AADT traffic counts of over 53,000 at the intersection. Plaza at Davie is a 304,017 SF shopping center located in Davie, Florida, in a “billboard location” along Interstate 595 (the only east/west highway serving central and southern Broward County). The center has excellent visibility (+2,300 feet of frontage), sitting at the SWC of Hiatus Road (on/off ramp access to I-595) and W. State Road 84. 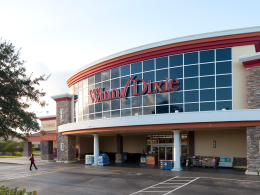 Recently remodeled, the center’s tenants include Winn-Dixie which completed an in-store upgrade in 2018, Lowe’s, Walgreens, Ruby Tuesday, McDonald’s, iFly, AquaTots, Pizza Hut, Petland and Metro USA. With traffic counts of 160,000 on I-595, 12,000 on SR-84, and 13,000 on Hiatus Road, this center is highly trafficked by residents and commuters in thriving western Broward County. 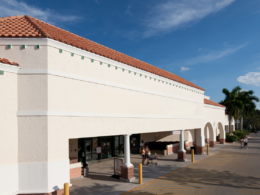 Admirals Crossing is a grocery-anchored shopping center in Jupiter, Florida, with excellent visibility and accessibility at its location on the northeast corner of Military Trail and Frederick Small Road. FDOT traffic counts at the intersection are over 38,000. There are over 73,000 people living within 3 miles of the center where the average household income is +$136,500. The Scripps Research Institute is approximately 1 mile away, adding to the daytime population with as many as 6,000 high paying jobs. 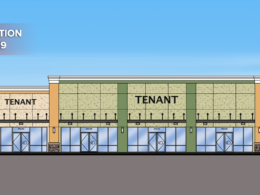 Tenants at the center include Sprouts Farmers Market (coming soon), Planet Fitness (coming soon), Massage Envy, Jimmy John’s, My Gym, Berry Fresh Café and Inlet Liquors. 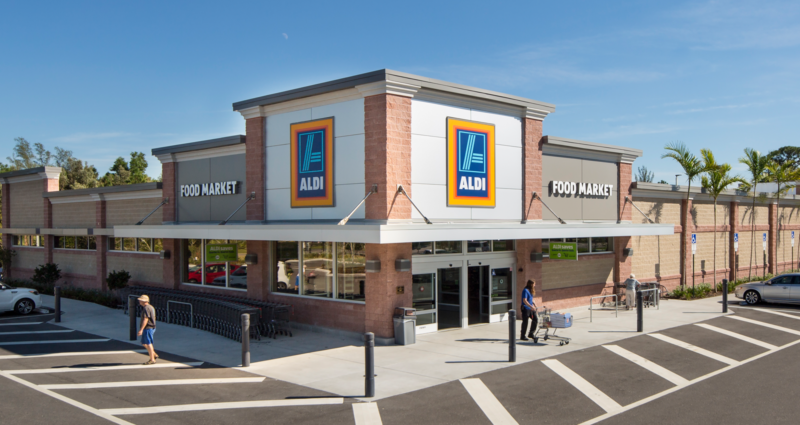 Grand Oaks Town Center is a new 62,400 SF grocery anchored center located in Ocala, Florida that opened in November 2014. Adjacent to a future 600+ unit multi-family project and across from Trinity High School, this location has traffic counts of 21,500 on SW 27th Ave and 17,900 on SW 42nd St. The SR 200 flyover recently opened and provides direct and short access to SR 200, a major corridor in the region. Outparcels are available for lease or build to suit along SW 27th Avenue.